Friday and Sunday nights at 6 on WZUM. Friday night, and again on Sunday night, Renée J. Govanucci, Director, MCG Jazz, and Marty Ashby, VP & Executive Producer of MCG Jazz share the lineup for next year at MCG Jazz, Season 33!. Spring of 2020 at MCG Jazz will have the long awaited return of musical friends, plus first-time appearances by exciting artists, including Wynton Marsalis and the Jazz at Lincoln Center Orchestra. This week, hear sounds from Grammy Winning vocalist Cecile McLorin Salvant, pianist Kenny Werner, Ann Hampton Calloway, Nicole Mitchell, the Tierney Sutton Band, and more. 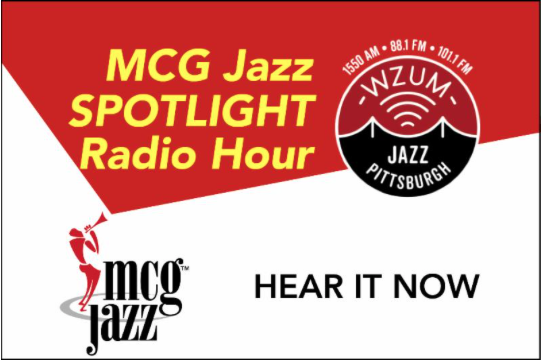 Join Renée J. Govanucci, Director, and Marty Ashby Night at 6 - and we’ll do to again, Sunday at 6 on WZUM, the Pittsburgh Jazz Channel!